Growing your crops from seed has several advantages over buying them from your local garden centre. It can be a great deal cheaper than buying plants, you have total control over how your plants are raised (particularly important if you want to keep to organic principles), and there is a much wider choice of varieties and vegetables. 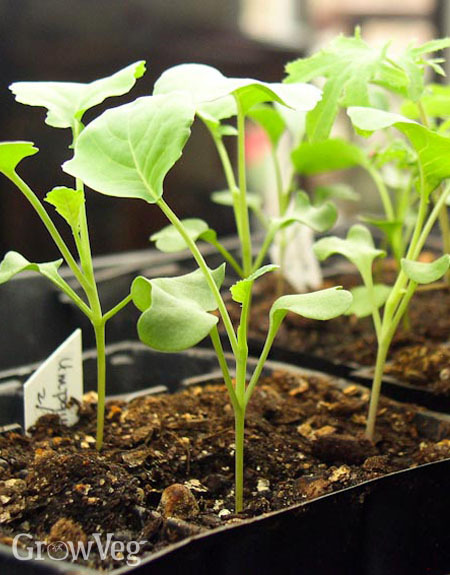 Raising seedlings indoors will put you a few weeks ahead of the normal growing season. While the soil is still cold and the threat of frost lingers, your tender seedlings will grow happily on a windowsill (with a clear plastic bag over them while they germinate) or in therelative warmth of a propagator. The best plants to start off early include aubergine (eggplant),tomatoes, peppers and basil, early bulb vegetables such as onions and leeks, some brassicas such as cauliflower and calabrese (broccoli). For best results, two or more seeds are usually planted per pot and then thinned out by carefully removing the weaker ones. This ensures there is enough room for the stronger specimens to develop. Larger seeds such as peas and beans should be sown two per planting station, then, after the first ‘true leaves’ have formed, thin out the weaker seedling. Smaller seeds can be scattered over compost in a seed tray and then thinned out to give each one sufficient space (your seed packet will tell you how much room each variety needs). Once two or three true leaves have formed on the plants they should be ready to plant in an individual container (such as a 5 cm pot) or directly outside, provided all risk of frost has passed. When transplanting seedlings to a large pot make sure that you only hold them by the leaves as it is easy to damage the plant by pinching the stem. Using a teaspoon to ease out the roots can ensure minimum disturbance to their growth. Before you plant your crops outside, you need to harden them off. Hardening off allows the plants to acclimatise to the colder conditions outside. 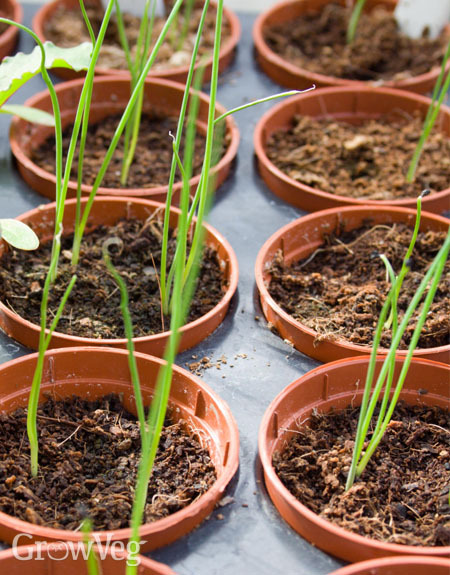 To harden seedlings off, move the propagator or pot outside during the day and bring it in again each night. Do this for five days and then leave the plants outside during the night for two nights. They will then be fully adjusted to the cold conditions when you plant them in the soil. Planting out should not be left too late or your young plants will become ‘leggy’ due to the reduced amount of light on a windowsill or inside. However, this has to be balanced with the possibility of a late frost which could kill seedlings off after all your hard work! For all vegetables, it is worth preparing the soil by digging the plot over thoroughly, removing all weeds and weed roots and raking the ground level. It helps to plant out your crops in the late afternoon on a cloudy day so they avoid the heat of the midday sun and the sudden temperature drop of clear nights. After planting, your plants may initially droop but they should perk up soon if kept well watered during the first few days. Seedlings and crops which have been recently planted out need to be watered gently. Ensure the soil or pots don’t get waterlogged or dry out. For a gentle dousing, water your crops with a watering can with the rose upturned, or stand pots in a tray of water for a short time to let water wick up from below. Some vegetables such as peas and beans, root vegetables and sweetcorn prefer to be planted directly in the ground in their final growing positions. Root vegetables can be sown directly into their final growing positions in spring. Legumes (such as beans and peas) and sweetcorn can be sown directly into the soil in early summer or grown in biodegradable coir pots that can be transplanted into the ground with the plant. This avoids root disturbance, which can halt growth for a few weeks. Some brassica crops actually benefit from being transplanted. For example transplanting Brussels sprouts helps them develop a robust root system, which is particularly useful if your plot harbours the common club-root fungal disease. Seeds can be sown in rows in a seedbed (a nursery area where you start off plants as seeds) and then transplanted later. Whenever sowing outside, it makes sense to sow in rows. This will help you distinguish your seedlings from other plants – essential when weeding in the early weeks. You may choose to plant in long rows making a furrow at the depth specified by the seed packet. Space seeds according to the instructions given and thin out the weaker seedlings once they have emerged. Cover the seeds with a fine layer of soil and gently firm them down, then water. Alternatively if your garden is divided into beds you may wish to sow in blocks to concentrate more seeds into a smaller area.